The application deadline for the Transfer Scholarship is November 1 for spring 2018 admission. The admissions application serves as the scholarship application. WKU awards merit-based scholarships to undergraduate students who transfer from a regionally accredited institution based on their academic achievements. Renewable scholarships range from $1,500 to $4,000, depending on eligibility criteria. Students may choose to study online or at one of our campuses in Bowling Green, Elizabethtown-Fort Knox, Glasgow or Owensboro. 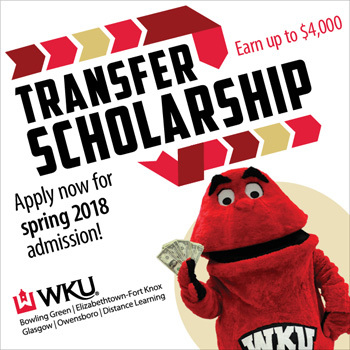 For more about the Transfer Scholarship and other information for students interested in transferring to WKU, visit The Transfer Center. For a complete list of all scholarship opportunities that are available for students at WKU, visit TOPDollar.